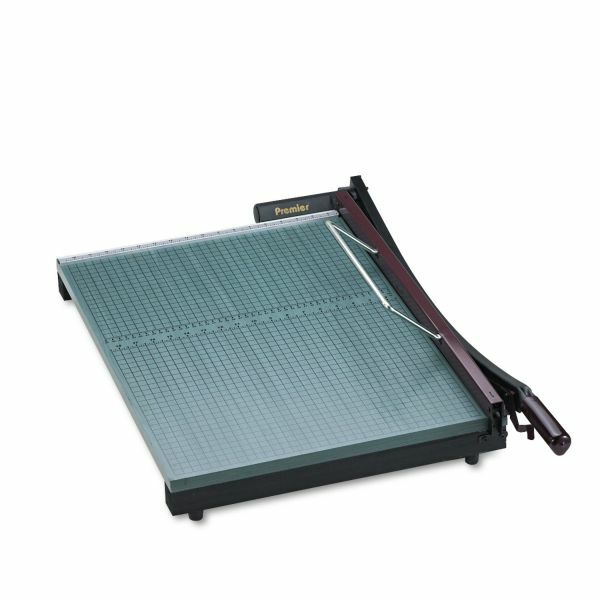 Premier StakCut Paper Trimmer, 30 Sheets, Wood Base, 19" x 24-7/8" - Heavy-duty paper trimmer is specially made to accurately cut paper, matte board, cardboard, film, tissue and textiles. Through-hardened steel blades precision-angle cut up to 30 sheets at once. Heavy, 3/4 wood base offers a permanent, 1/2" alignment grid and dual Imperial/metric rulers for precise cuts. For safety precautions, the patented, automatic blade latch locks with every cutting motion. Safety features also include finger guard to protect the entire length of the blade. Torsion spring prevents blade from accidentally falling during operation. Hand-operated clamp holds items securely for accurate cutting. Design also offers an ergonomic, soft-grip hand grip for comfort and nonskid rubber feet."